As covered on Kotaku yesterday, photos of schoolgirls doing faux manga style martial arts moves have been popping up on forums and threads in Japan. Those photos, however, are just the tip of the iceberg. 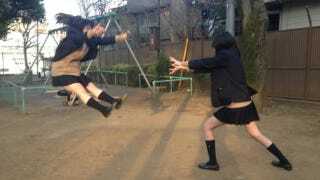 Numerous Japanese teens, it seems, are uploading photos of themselves doing the Kamehameha attack from popular manga and anime series Dragon Ball. Many of the photos, which also could be influenced by these floating pics, were uploaded to Twitter within the last week or so. On Twitter, Japanese teens are saying that this is how they've recently been goofing off with friends. During the 1980s, when the Dragon Ball anime was on primetime television, kids would unleash Kamehameha attacks on each for fun at school or in the park. The difference here is that teens these days can snap digital photos and upload them for instant internet fame. Why now? It's perhaps because a new Dragon Ball anime, Dragon Ball Z: Battle of Gods, is slated to hit Japanese movie theaters at the end of the month. This is the first Dragon Ball animated feature to get a theatrical release in 17 years—and the first one to get viral pics of teens doing its signature move. Very important update: The trend is spreading from schoolgirls to bikers! Yet another very important update: It seems the trend is starting to make its way outside of Japan (below: @xabitolosa and @nOahcarlstrom).